Will the US request a bailout? Will the International Monetary Fund grant it? On what terms and conditions? What writedown of US debt will be needed to restore sustainability to its fiscal accounts? What impact will this have on world financial markets? These are not questions being asked today but they are questions worth contemplating. Thinking the unthinkable is one of the lessons of the eurozone saga. Another is the speed with which complacency can convert to crisis. So although I am not predicting Armageddon, I would like to signal a series of factors that policy makers of all nationalities would do well to keep in mind. The first is that a small percentage of a big number is a big number. US debt outstanding exceeds $16tn. Each percentage point rise in interest rates adds (over time) $160bn to annual debt financing. Thus a 5 per cent rate rise adds $800bn to the budget deficit and, given compounding, more than $8tn per decade to the national debt. The second factor is that more than 45 per cent of tradable US debt is held by foreigners. The Japanese are in hock to the Japanese people. The US is in hock to – among others, the Japanese. Third: sovereign bonds are no longer presumed to be risk-free. Indeed, there is now general awareness that at some level of financing costs, government debt becomes unsustainable. Five years ago, posing the question: “At what interest rate does Italy or Spain’s deficit financing become untenable?” to analysts, economists or journalists would have elicited a shuffling of the feet or a shrug of the shoulders. Ask today and the quick reply will be: “Why 7 per cent of course.” We have been educated. Fourth: globally, there are some $20tn of funded pension assets, $60tn of professionally-run assets under management and $600tn of various derivatives. The pricing of the related liabilities, expected returns and valuations is tied directly or indirectly to the yield on US Treasuries – all on the assumption that US paper represents a risk-free rate of return. Remove that assumption and we are in a financial world without gravity. The fifth factor is that sophisticated investors have understood the first four factors. Aside from adjusting exposures at the margin they are exploring two changes, each with profound implications for capital flows. First, they are asking leading investment firms to create a basket of securities that could replace the risk-free properties of US Treasuries of yore. Second, they are considering a shift from bond indices weighted by market capitalisation to benchmarks based on creditworthiness. The former favour US Treasuries, the latter may not. To the extent that these initiatives become trends, capital will flow away from those who borrow most and towards those who borrow least. Yields will reflect the change. Sounds familiar? Locals in Lisbon can advise. Sixth, financial repression may have unintended consequences. Aside from the yield-depressing effects of the three rounds of quantitative easing and other central bank operations, there has been a less widely reported liquidity effect. By some estimates, the Federal Reserve now owns all but some $750bn of US debt issued with maturities of 10 years or greater. This suggests the Fed is running into limitations on how much more it can buy while preserving dealing depth; that friendly foreigners have used the Fed’s market interventions to shorten the duration of their US holdings; and therefore that America’s creditors are less vulnerable than imagined to the threat of market losses – should they wish to exit. The seventh factor concerns the “ugly sister syndrome”. Ever wonder why the euro has been so resilient against the dollar? That the euro has not tanked may say more about the global search for an alternative to the dollar than it does about confidence in Europe’s determination to save the single currency. So it is worth considering the degree to which progress on the euro might trigger a crisis in the greenback. When the spotlight shifts from Europe, where will it light? With the US election behind us, the challenges associated with the looming “fiscal cliff” of planned tax hikes and spending cuts now dominate the debate. The optimum solution would avoid undue belt tightening in the short term combined with credible deficit reduction in the longer term. Alas, a more likely outcome will involve some version of kicking the can further down a shortened piece of road. Here too, the old world holds lessons for the new. Indeed, faced with the prospects of postponement, the market may soon be asking a different question: which is the greater threat – that the US goes over the fiscal cliff or that it does not? Robert Jenkins is a former fund manager and current external member of the Financial Policy Committee of the Bank of England. He writes in a private capacity. There is a huge amount of investible cash that is now sitting on the sidelines, waiting for sensible reforms. Four years ago, it was said that the incoming Obama administration aspired to the dynamic that existed in Abraham Lincoln's cabinet, where former competitors and antagonists came together to help the country through the Civil War. If Doris Kearns Goodwin's "Team of Rivals" was the historical aspiration then, the model to emulate after this election is her earlier book, "No Ordinary Time," about Franklin Roosevelt's domestic policies during the latter years of the Great Depression and into World War II. The 1930s were a period of extreme bitterness between the business community and the Roosevelt administration. Many executives deplored the president's policies and refused to even utter his name, referring to him as "that man in the White House." In turn, the president famously declared during the 1936 re-election campaign: "I welcome their hatred." Yet, well before the bombing of Pearl Harbor, these adversaries made common cause to defeat Germany and Japan. The result was an unprecedented surge in industrial production that would crush the Axis powers and lift the American economy out of the Great Depression. Roosevelt showed leadership, and business answered the call. Relations between the Obama administration and large segments of the business community have been strained and unproductive. But the election offers an important opportunity to forge a more productive relationship. By electing a divided government, Americans didn't choose two years of squabbling and inaction until the next election—and the country cannot afford that. 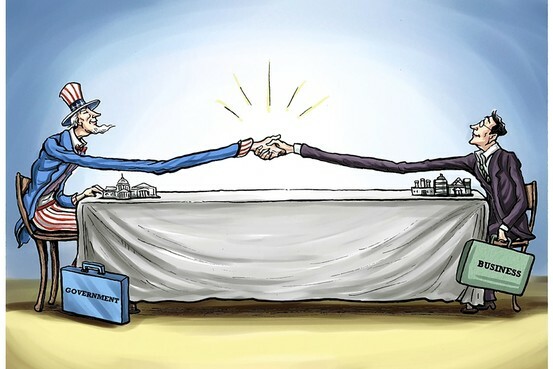 Both parties will have to compromise to make progress. • Remove the risk of a double-dip recession and give the economy a stimulative jolt. Expiring tax cuts and budgetary sequestrations that take effect on Jan. 1 will derail the fragile recovery. Any political agreement to cope with the "fiscal cliff" will require flexibility and shared sacrifice that some in both parties seem unwilling to allow. We in the business community have a responsibility to contribute to a better understanding of the urgency of averting a crippling and self-inflicted recession. At the same time, we also need to talk about the significant opportunities that would result from forward-looking change. There is more than a trillion dollars of cash that is sitting on the balance sheets of U.S. nonfinancial companies. With certainty about tax rates, companies will increase their capital expenditures (currently at anemic levels), contributing to a virtuous cycle of jobs and growth. • Restore confidence in public finances. The United States currently enjoys low interest rates and modest inflation. But government budget deficits and a growing debt burden will eventually lead to sharp increases in both. A grand fiscal bargain—perhaps using the Simpson-Bowles plan as a starting point—should include spending cuts, entitlement reform and revenue increases. Some of the reforms should be enacted now but implemented later to avoid the risk of recession. The business community vigorously supports efforts to conclude a bipartisan fiscal accord. I believe that tax increases, especially for the wealthiest, are appropriate, but only if they are joined by serious cuts in discretionary spending and entitlements. A number of CEOs and companies agree and support principles that call for a comprehensive and balanced solution to the debt problem—increased tax revenues and decreased spending. • Keep marginal tax rates low. Democrats and Republicans complain about the complexity of the federal tax code, but serious reform has been almost nonexistent. Broadening the personal income-tax base by closing loopholes will generate substantial additional revenue while minimizing increases in marginal rates that could stifle risk-taking and robust growth. The Obama administration has already signaled its interest in reducing the corporate income-tax rate. Business leaders should work with the administration and Congress on tax legislation that would reward work and bolster investment, while retaining the tax system's essential progressivity. • Act like we need to compete and win—because we do. For the first time in several generations, it has become clear that abundant domestic energy resources are within our reach, and that we have the technology to responsibly and safely extract it. The government needs to work with the private sector to implement effective and far-reaching policies to develop these resources. Energy policy is crucial: Developing America's domestic resources means every other industry in the economy can take advantage of lower energy prices and become more globally competitive. The U.S. can compete more effectively in global trade. As the economy recovers, the country should move forward to realize bilateral and regional agreements, enhancing the international flow of goods, services and capital. America has more strengths at its disposal than most to compete, including a culture that encourages innovation and entrepreneurship, and favorable demographics. Sensible immigration reform is also a high priority. Washington needs to make it easier for talented people to live and work in the U.S. Foreign students who graduate from American universities should be eligible to work in the U.S. permanently. The cap on visas for skilled workers should be removed; and let's make it much easier for promising entrepreneurs to work and create jobs in the U.S. I know many in the business community are ready to get behind real immigration reform. America has a long tradition of talented and experienced people who have gone to work for the government after a successful business career. They bring to public service useful perspectives about how business operates and, while in government, they develop a deeper appreciation for the responsibility government has to broader constituencies. Their experience is a virtue, not a vice, and should be encouraged in the years ahead. My firm works with many companies in the Fortune 500 and, of course, the leaders in these organizations have different policy views and opinions. But I know that they all want to see progress and contribute to it. We are all ready to roll up our sleeves and work with the Obama administration and Congress to help fulfill America's enduring promise. Mr. Blankfein is chairman and CEO of Goldman Sachs. “There were at least one million people marching in the streets,” said Alejandro. When I had driven past the center of town earlier that afternoon, around five, there were only a few thousand. “Where’s the rest of the demonstration?” I asked. “Oh,” Enrique replied, “this is Argentina. Everything starts later here. People won’t really start gathering till eight.” Small pockets of people had started gathering on every street corner, banging their pots and gathering their neighbors as they made their way to the center of town. A trickle soon became a large stream and then a massive river. All across Argentina, demonstrations were held protesting the policies of President Cristina Kirchner. The local press proclaimed the crowd in Buenos Aires to be 700,000+, protesting the increased authoritarianism and policies that are clearly hurting the economy. “As rich as an Argentine” was a saying at the beginning of the last century. And indeed Argentina was one of the richest countries in the world in the early 1900s. It has been a long, slow decay since that time. There have been many upheavals and sea changes. Once, in the early 1990s, Argentina saw hyperinflation, destroying the value of savings. Prices rose by a factor of 20 billion in Argentina from 1975 to 1991. Inflation was eventually contained by fixing the exchange rate, but by 2000 there was serious economic disruption, with bank runs and the eventual collapse of the dollar peg. Some argue that the economic and political crisis was worse than before the peg was put in place. By the end of 2002, the economy had contracted by 20% since 1998. Over the course of two years, output fell by more than 15%, the Argentine peso lost three-quarters of its value, and registered unemployment exceeded 25%. Income poverty in Argentina grew from an already high 35.4% in October 2001 to a peak of 54.3% in October 2002. To say things were volatile is an understatement: Argentina had five presidents in two weeks. Chaos? The destruction of wealth? No doubt. But as I sat down in a very fashionable restaurant in the historic and beautiful Recoleta district, in the midst of one of the largest demonstrations in Argentine history, the contrast of the recent past with the wealth I saw around me was thought-provoking. I thought back to my first visit to Argentina, just after their period of hyperinflation in 1992. It’s hard not to notice the impressive buildings that have been erected since then. And I had just come from Salta province, where agriculture holds sway and the commodity price boom is in full force. For the last two weeks I’ve been in Brazil, Uruguay, and Argentina. In this week’s letter I offer a few impressions gathered on this trip, as we meditate on what French physiocrats have to tell us about true wealth. “If you want to enjoy life, go to Buenos Aires. If you want to do business, go to Sao Paulo,” the saying goes. It is hard to get an impression of a country by going to a city of 20 million people. It is like visiting New York City and thinking you can understand the United States. But I never fail to enjoy myself in Brazil. While it is clearly a Latin culture, the country has become serious about the business of business. I spoke to a large gathering of financial professionals (the local CFA society). Gustavo Franco, the former Brazilian Central Bank President who orchestrated the Plan Real, which helped save the country from hyperinflation in 1993, spoke before me in a very formal economic presentation. Inflation was running 30% per month in Brazil when his plan was implemented. Here was a man who truly understood the power of a central bank committed to stable monetary policy. I felt like the comic relief act trying to follow him, but his presentation left me with a thought. Both Franco and the CFA society were thinking about monetary policy. And not just Brazilian monetary policy. They were looking around the world, and the massive quantitative easing underway was clearly causing concern. Currency valuations in a country where commodities play such an important role as they do in Brazil can mean the difference between boom and bust. The fact that the central banks of some of their largest customers are seemingly going wild does not make for a stable environment. I have often said that I do not consider gold as an investment but rather as insurance. But the question is, insurance against what? As I spoke to that audience with their particular concerns, I realized that gold is central bank insurance. Central bankers are quite content to talk about stable monetary conditions, but history has shown all many too times that, under pressure, monetary stability yields to political exigency. I went from Sao Paulo to Montevideo, Uruguay. As I reported last week, Uruguay is booming. Money is pouring into the country from all over the world but especially from Argentina. The country has an essentially open border with Brazil, too. Goods, people, and services travel freely both ways. You can get US dollars as well as Uruguayan pesos from the ATMs. The country is a financial center, as it has a well-established rule of law and economic free zones where business can be done tax-free as long as it does not produce income in Uruguay. A large number of international corporations have their Latin American headquarters in Uruguay. From a seriously challenged economic condition ten years ago, the country has grown to full employment and an increasingly diversified economy. Real estate is booming, and not just in agricultural land. Punta del Este is the playground of South America, and one tower after another of vacation condominiums seems to be rising on the beautiful beaches. Condominiums are being built and sold in Montevideo at a rapid clip. Interestingly, in general the building is being done without debt. Large projects are financed with equity. Clearly, in the current culture there will never be a debt supercycle to blow up, at least not one generated by the private sector. And for now the government is behaving. An interesting sign of the current prosperity is that 50% of children now go to private schools. Evidently, one of the first things that parents do when they get extra income is to put their kids in private schools. In talking with financial professionals and businessmen in Uruguay, it was clear that there is a large influx of Argentinean money and people, and has been for years. That trend has only increased since the re-election of Cristina Kirchner. I rode with Enrique through the Uruguayan countryside to the historic and picturesque city of Colonia, where I took a ferry to Buenos Aires. The countryside reminded me of East Texas with palm trees. I flew the following day to Salta province and then drove with my partner Olivier Garret to Cafayate, through one of the most beautiful canyons I’ve ever seen. We eventually rose to a beautiful, broad valley surrounded by Andean foothills. I was told that Cafayate, because of its high altitude, is the only tropical region that grows decent wine grapes. The climate is close to perfect year-round. The small city is captivating and full of energy. Vineyards and farms were everywhere. The city square is alive at night. I was captivated by Cafayate and will go back again, hopefully many times. My partners in Mauldin Economics have created a world-class development there, drawing residents from over 30 countries. Wine production is growing dramatically as more and more acreage is planted. The scenery is just magnificent, with the mountains changing color throughout the day. I had the privilege of meeting Juan Carlos Romero, the former governor and current senator from the province of Salta, at his local winery. He has run for president and is currently the vice president of the Senate. He is the very image of the classic patron, right from central casting. Athletic and youthful at 62, he was a gracious host. He was somehow able to summon a European nonalcoholic beer in two minutes, when we had been looking for one in town for several days. He was smiling and pleasant until I began to inquire about Argentinean politics. Then his eyes turned a bit steely as the conversation deepened. His concern for his country was evident. Having been a businessmen and politician through the last two major crises, he clearly disagrees with the current direction of policies, and he left the majority block a few years ago. I was privileged to have a number of other conversations with leading business and academic figures in Argentina, some quite off the record. It appears a great deal of the opposition to the current president is coming from within her own party. That being said, she took 54% of the last vote and recently was able to get a law through their Congress allowing 16-year-olds the right to vote. She is evidently quite popular among the youth. The concern is that with a two-thirds majority in the Congress she could override constitutional term limit and be reelected in 2015. In such a world, how do Argentinean investors establish long-term wealth? The answer is, they are buying what they know, but in other countries. And what they know is agriculture. An increasing number of farms in Uruguay are owned by Argentinians. But it is not just the Argentineans and not just South America. Farmland all over the world is rising in value, as the case for rising demand for agricultural products is quite solid. I had dinner here in Dallas last night with Grant Williams (who writes things That Make You Go Hmmm…) and his boss, Stephen Diggle of Vulpes Management, who were in from Singapore. They own and run three largish agricultural projects in Illinois, New Zealand, and Uruguay and are looking to acquire more. They sent me a few graphs I will share with you on the rising demand for agricultural products. 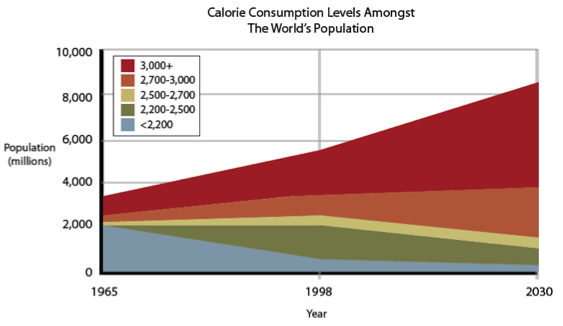 First, calorie consumption is higher than ever and rising rapidly, as the world’s population grows and demands more nutrients. 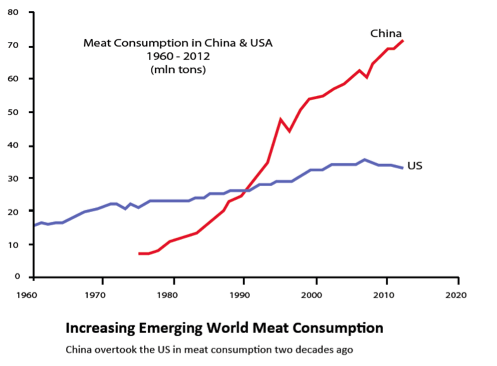 In the cattle-farming industry, it is said that it takes 6 kg of grain to produce 1 kg of meat, so 1.3 billion Mainland Chinese changing their diet to eat much more meat will severely strain the resources of a planet already struggling to feed a growing population. Chinese dairy consumption is rising by 20% compounded per year. That sort of growth requires a lot of feed and land to grow it on. 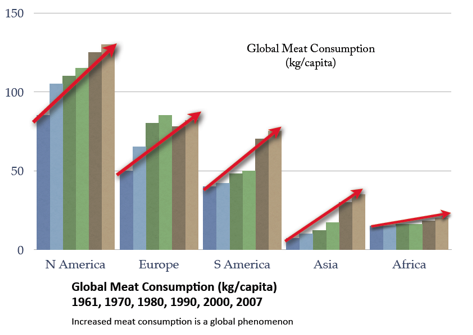 It is not just in China that meat consumption is rising, but throughout the world. And if Asia catches up to Europe and South America, let alone the US, that is a huge increase in the need for grain. The investment yields on farmland are in general lower than you might think. But properly managed farmland (bought at the right price) can be a nice alternative asset. I could make the case that agricultural land is yet another form of gold. It too is central bank insurance. Over the long term, its value will rise in relation to the fiat currency in which it was purchased. It is a question of yield. In place of the old alchemical pursuit of the Philosopher’s Stone, which could change lead into gold, we now have farmland turning dirt into yet another form of real wealth. Diggle makes the case that farmland is rather cheap in terms of gold. You can buy a bond that will yield 5% for 20 years (or you could a few years back! ), but that yield will not change for 20 years. The yield on farmland will change with the price of the crop from year to year and remain subject to the vagaries of weather, pestilence, etc. 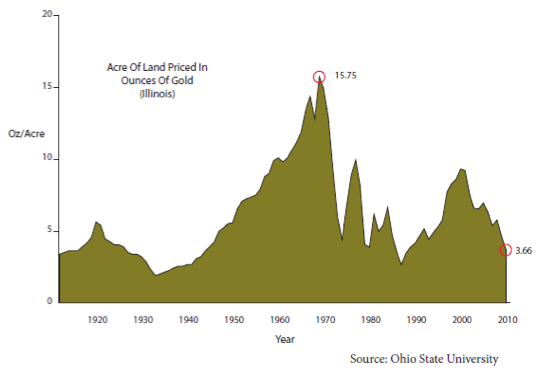 ; but the value of the land will hold its own over time in the face of central banks gone wild. The world will always want more food. Increasingly, agricultural products have become global commodities, with their prices the same from place to place, when transportation costs are factored in. Land has one thing going for it that gold does not, though, and that is yield. Some years the yield might not be much, or even negative, but over time there is a return. And it can be a nice one. Gold with a yield. A bond with built-in central bank insurance. That is a nice combination. But gold has a few things farmland does not have. It is portable. While farmland is a store of value, it is subject to the policies of local government. You can’t pick up your farm and move. As one of the leading lights of the physiocratic school of thought, Francois Quesnay, said, “Without that sense of security which property gives, the land would still be uncultivated.” But you have to know that the land and its fruits can be securely yours. Gold is liquid. While farmland will, in general, readily sell, at the wrong moment the price may not be in your favor. Gold can be a bridge, a form of crisis insurance. I have a number of friends who bought land quite cheaply during the last crisis in Argentina. In our own crisis of 2008, many people I know were liquid and bought land and other assets at fire-sale prices. People who had overextended themselves or who needed cash to survive had to sell at whatever price they could get. During the oil bust and the savings and loan crisis in Texas in the late ’80s, you could buy real estate at 15-20 cents on the dollar. Whole portfolios of loans from bankrupt savings and loans were sold at literally pennies on the dollar, and those who bought them made fortunes. The real crises were soon over, but if you did not have the staying power to make it to the end of the crisis, it made no difference to you that things were getting better. I buy some gold every month and have for years. I hope the price of gold goes down so I can get more gold for the dollars I spend, as I am hoping I never have to sell my gold. If I ever do, things will not be going well at the Mauldin household. At some point, I might get interested in going back to my country roots and getting involved in agriculture, if only as an investor. It is another interesting form of real estate and real-asset investing. I don’t want you to think I am an overly conservative investor. I probably should be, but I’m not. I should note that Stephen Diggle and I share a passion for technology and biotechnology. Gold and farms and real estate are part of a diversified portfolio, but they are typically not the high-growth portion. I have too great a share of my personal assets in small-firm technology, but I can’t help myself. I am actually a big believer in the future and look for things that I think have the potential to “scale” or even to transform society. My friend and documentary film producer Jim Bruce is introducing what I think is going to be a very important documentary on the Federal Reserve. The movie, Money for Nothing: Inside the Federal Reserve, will have its world premiere at the International Documentary Film Festival in Amsterdam, on Nov. 15. After that, the plan is to screen the movie in US theaters in 2013, then release it on television and DVD. Money for Nothing is an independent, nonpartisan, feature-length documentary film. There are appearances in the film by former Fed Chairman Paul Volcker; investor Jeremy Grantham; former Vice Chairman of the Fed Alan Blinder; Peter Fisher, former Under Secretary of the Treasury for Domestic Finance; Philadelphia Fed President Charles Plosser; Richmond Fed President Jeffrey Lacker; Vice Chair of the Fed Board of Governors Janet Yellen; prominent Fed watcher James Grant of Grant's Interest Rate Observer; Barry Ritholtz; Dr. Gary Shilling; and your humble analyst. The film questions the rationale behind today's Fed actions and calls for better policies in the future. The producers need a few more dollars to finish everything, so please join me in getting out a really valuable tool in the effort to educate America about the Federal Reserve. You can pledge on Kickstarter and receive cool gifts in exchange for helping the film the last few steps to the finish line:Click here. It is once again time to hit the send button. I hope my meandering thoughts on gold, agriculture, and real wealth had something close to the impact for you that they had when they first occurred to me. Copyright 2012 John Mauldin. All Rights Reserved.